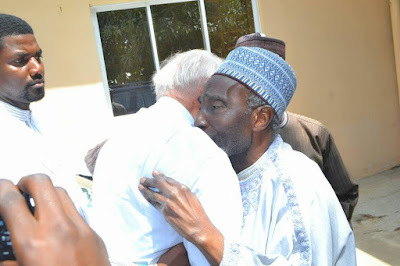 Photos of a Catholic priest and an Islamic cleric locked in a tearful farewell embrace have gone viral after they were shared by a Nigerian Facebook user named Halima Bwari. According to Halima, it happened in Minna, Niger state between Father O'Connell, a Catholic Priest, iand Shaykh Ahmad Lemu, an Islamic Cleric. Halima captioned the photos:The kind of embrace that is much needed especially in these days of insistent hate & dislike. 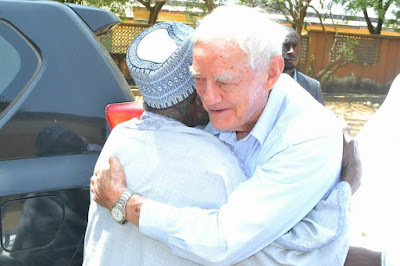 Father O'Connell, a Catholic Priest, in a tearful farewell embrace with Shaykh Ahmad Lemu, an Islamic Cleric, in Minna. Father O'Connell has served in a Government Secondary School, Minna as a Principal for 50 years. He turned 80 earlier last week or so. He returns to Ireland on retirement. These 2 men have between themselves, educated, positively influenced and molded many Nigerlites, including my father & mother, among other close family & friends. May our lives be that of service & usefulness to others. Amin.